On the way from Anegundi to Dharwad, while passing through Gadag, we decided to see Basaveshwara statue. 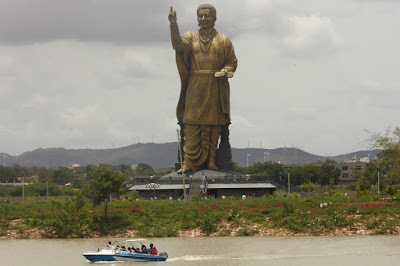 The statue can be seen from the highway.. I'd seen it several times since 2014 while passing through the city. So, the day finally arrived. 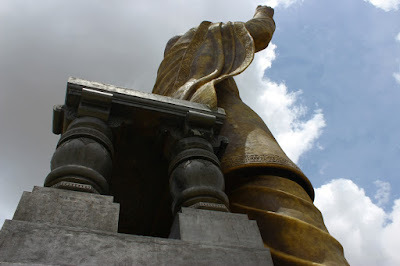 The statue is situated next to Bhishmakere - a 100+ acre lake. It's construction started in 2009 and completed in 2015. 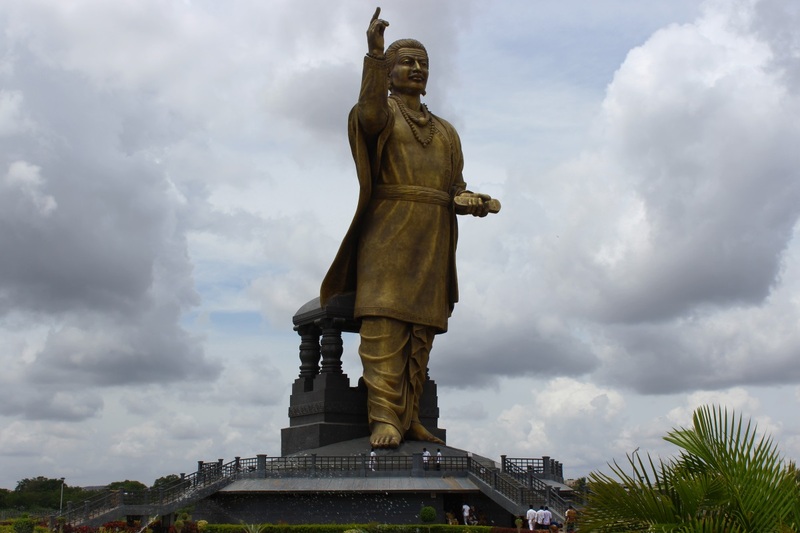 This standing Basaveshwara is 116 feet tall, 8 feet taller than the sitting Basaveshwara of Basava Kalyan in Bidar district. The team behind this creation has done a great job. 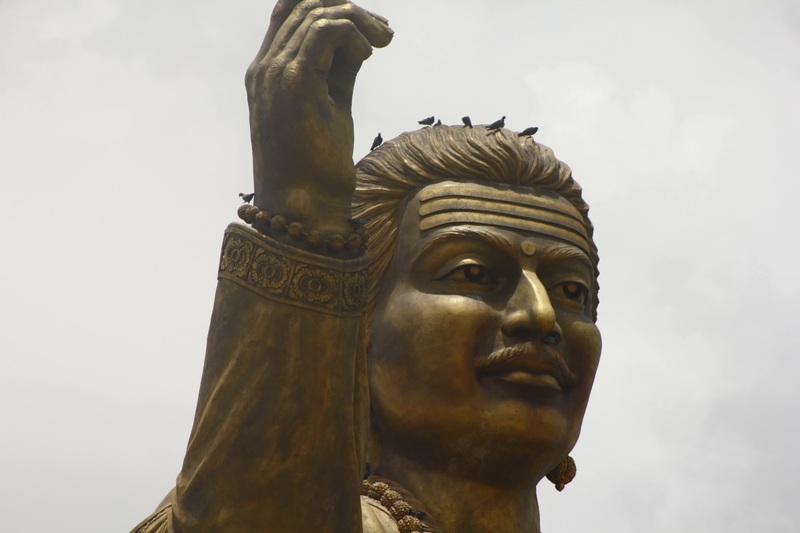 Basaveshwara seems to quoting the Lingayath maxim.. Kayakave Kailasa. A relatively miniature Aikya Mantapa of Kudala Sangama is a thoughtful addition. A small platform around the statue lets people walk around its base. Looking up towards Aikya Mantapa. The rear portion of the structure. 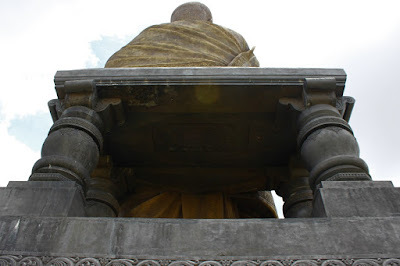 Below the statue is a circular chamber housing a small museum of some significant events of Basaveshwara's life. The colorful scenes are depicted in the form of lifesize statues and paintings. 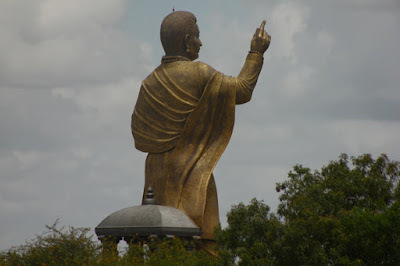 Basava as seen from street nearby.. i.e. as we drove from Koppal side into the city. The memorial has a neat little garden around it. Besides the statue, the other attraction of Bhishmakere is boating. One can hire boats and peddle around or go for ride in a motor boat. A smaller creation of two women pouring water from a pot is part of the memorial. Lot of work has been carried out to "develop" Bhishmakere, hope the city gets sufficient of rains to fill it up. 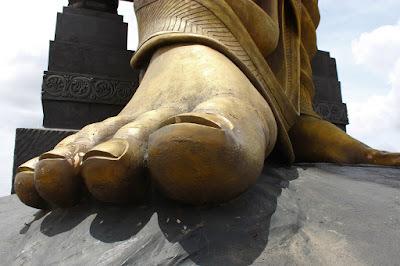 looks great.. but against the teachings of sri basaweshwara. "Ullavaru shivalaya maaduvaru.. "
yes, in spirit its against Basavanna's principles. that's the difference between Basavanna and common people..